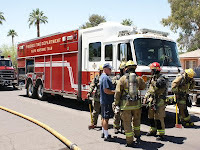 At aprox 11:15 I hear a call for a dryer fire near 51st street and Virginia. 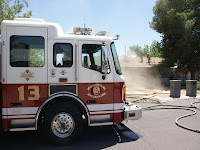 Engine 13 was called and arrived on scene rather quickly as their station is only about 3 blocks from where the fire was. 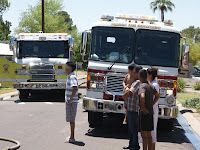 They arrived on scene and immediately upgraded the call to a 3 in 1 house fire. 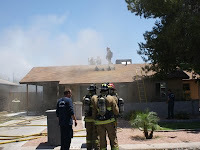 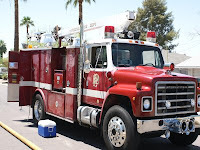 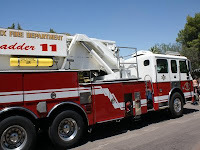 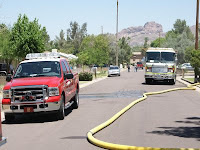 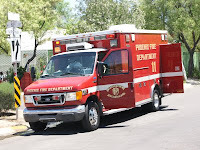 Additional apparatus were called including Scottsdale Engine 601, Scottsdale Engine 603, Ladder 11, Rescue 11 (Rescue 13 had been dispatched on another call), LT 12, Squad 29, Battalion 2, Battalion 5, an unmarked in bad need of a paint job utility truck, and CR 41. 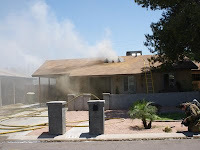 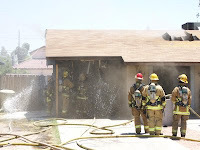 The fire had spread to the attic and the family of 4 evacuated. 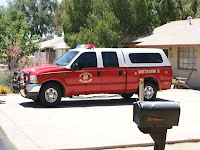 Battalion 5 was 51st st. command and from what I heard on the scanner it sounded like Ladder 11 was in some kind of trouble (for what I am not sure). 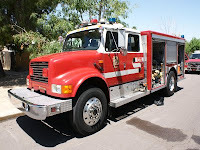 The crews had fire control and par by about 11:40, I left about 11:45 and passed CR41 inbound.